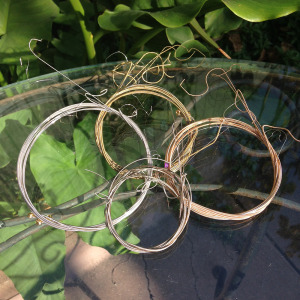 Old guitar strings awaiting disposal. Today we will tackle a very common question we receive here at the shop – “how often should I change my guitar strings?” Believe it or not, there isn’t really a firm answer to this question. It really depends on how often you are playing your guitar and various other factors that we will address in this post. 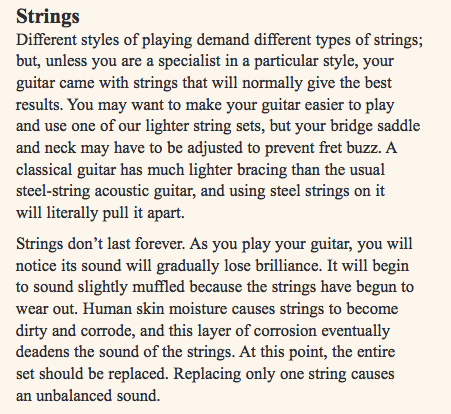 1) your strings begin to lose their “brilliance”; a term used to describe when a string starts to sound flat and dull. 2) your strings begin to physically look dirty or splotchy. 3) your strings aren’t achieving their desired intonation. There is no set rule for how often you should change your strings. If you have strings which are worn, flattened, kinked, corroded, rusted or mucked up with sweat grease and grime, then it is definitely time to change your strings. Really, the only other determining factor should be that if your strings are no longer giving you the tone, brightness and response that you desire, then it’s probably time to change them. “Once every 1.5 weeks” – Dexter H.
“When my fingers start to smell…I’m serious.” – Michael M.
* For the average electric guitar player, we recommend .010-.046 round wounds. * For the average acoustic guitar player, we recommend .012-.053 gauge phosphor bronze. There are so many types of brands out there, it’s hard to list them all. We stock D’Addario and Dunlop here at SF Guitarworks. We find D’Addario to be consistent (machine made, consistent ball end colorings so it’s easy to identify where they go, etc.) and we also love supporting the “hand made in California” Dunlops. Some people prefer coated strings like Elixirs or even the brass coated sounds of Thomastik-Infeld Power-Brights. We recommend trying a few to get a feel of what you like. With or Without You… this means you, Bono.